Jonathan Kane is a downtown NYC legend, as co-founder of the no-wave behemoth Swans, and the rhythmic thunder behind the massed-guitar armies of Rhys Chatham and the rock excursions of La Monte Young -- and as one of the hardest-hitting drummers on the planet. His critically acclaimed releases 'February', 'I Looked At The Sun' 'The Little Drummer Boy' and 'Jet Ear Party', power guitar-driven minimalism into the blues, and the blues into guitar-driven harmonic maximalism. 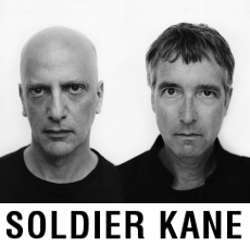 Kane currently performs internationally with his group Jonathan Kane's February, and with Dave Soldier in their duo project Soldier Kane.